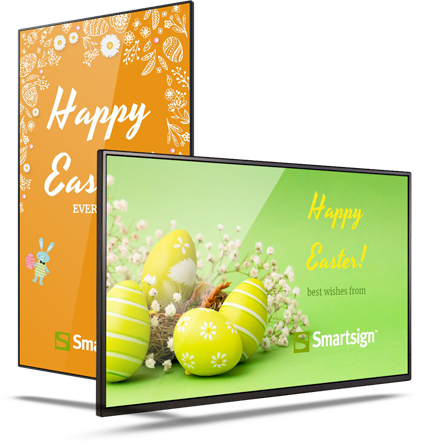 Smartsign Display Manager has been created to allow many different methods of use. The communication department, the shop, reception and the teacher can all manage content in their own way, you decide what everyone can do. How is the content updated? You log into Smartsign Display Manager via your browser, where you can see the connected screens. Select one or more screens and create a playlist that contains, for example, a PDF document and a video. Then schedule the playlist for selected weekdays and times, preview your playlist and publish it. How can you schedule your information? Playlists can apply around the clock or be scheduled to be displayed, for example, every Monday from 09:00–10:00. Many playlists can apply at the same time, i.e. the content displayed on all weekdays in the daytime can be extended with additional information that applies only between 14:00 and 15:00 on weekdays. How does the licensing model work for the cloud service? A licence is valid for one playing device. If you have a setup with one screen in reception and one in the warehouse, you need two licences. Our various products have different rules on the number of users – Smartsign Display Manager PRO permits an unlimited number of users free of charge. Can I display urgent messages quickly? Of course – urgent messages can temporarily replace the regular message or be displayed as text on top of the regular message. What kinds of media can I schedule? Smartsign Display Manager supports many different kinds of media. Common file types used are PowerPoint, videos, PDF documents, websites, images, Excel, RSS flows and Twitter. The cloud service uses Microsoft Azure, all data is stored within Europe. What happens if my screen loses its Internet connection? Most of the media scheduled will keep playing and run in accordance with the defined schedule. Exceptions can be certain kinds of hardware or content that is being shown live, e.g. a live broadcast video stream. Can I combine different kinds of screens in my solution? Yes. Both landscape and portrait mounted screens can be combined in an environment, and different manufacturers and player types can also be managed in the same environment. What kind of network connection is required? You can use a LAN connection, Wi-Fi or mobile data to connect the screens. Scheduled files are downloaded by the screens and stored locally, so they do not burden the network while they are being played locally. Can a solution be used locally only, within our firewalls? Yes, you can choose to operate the software in your own IT environment. Can I use Active Directory to log in? Yes, if you select locally installed server software. Contact us and we’ll help you.